You know the catapult is quite important. So I said what is this? Sir, this is our digital catapult system. He said well, we’re going to this because we wanted to keep up with modern [technology]. I said you don’t use steam anymore for catapult? No sir. I said, "Ah, how is it working?" "Sir, not good. Not good. Doesn’t have the power. You know the steam is just brutal. You see that sucker going and steam’s going all over the place, there’s planes thrown in the air. "It sounded bad to me. Digital. They have digital. What is digital? And it’s very complicated, you have to be Albert Einstein to figure it out. And I said–and now they want to buy more aircraft carriers. I said what system are you going to be–"Sir, we’re staying with digital." I said no you’re not. You going to goddamned steam, the digital costs hundreds of millions of dollars more money and it’s no good. The Electromagnetic Aircraft Launch System (EMALS) is a complete carrier-based launch system designed for CVN 78 and all future Gerald R. Ford-class carriers. The launching system is designed to expand the operational capability of Ford-class carriers, providing the Navy with capability for launching all current and future carrier air wing platforms – lightweight unmanned to heavy strike fighters. The mission and function of EMALS remains the same as traditional steam catapult; however, it employs entirely different technologies. EMALS uses stored kinetic energy and solid-state electrical power conversion. This technology permits a high degree of computer control, monitoring and automation. The Navy demonstrated early integration of the future of naval aviation 18 November 2011 when it launched F-35C test aircraft CF-3 with its new electromagnetic aircraft launch system (EMALS). Testing the F-35C on EMALS provided an early opportunity to evaluate technical risks and began the process to integrate the carrier variant Joint Strike Fighter with the future carrier fleet aircraft launching system. The U.S. Navy pursued electromagnetic launch technology to replace the existing steam catapults on current and future aircraft carriers. The steam catapults are large, heavy, and operate without feedback control. They impart large transient loads to the airframe and are difficult and time consuming to maintain. The steam catapult is also approaching its operational limit with the present complement of naval aircraft. The inexorable trend towards heavier, faster aircraft will soon result in launch energy requirements that exceed the capability of the steam catapult. An electromagnetic launch system offers higher launch energy capability, as well as substantial improvements in areas other than performance. These include reduced weight, volume, and maintenance; and increased controllability, availability, reliability, and efficiency. The present EMALS design centers around a linear synchronous motor, supplied power from pulsed disk alternators through a cycloconverter. Average power, obtained from an independent source on the host platform, is stored kinetically in the rotors of the disk alternators. It is then released in a 2-3 second pulse during a launch. This high frequency power is fed to the cycloconverter which acts as a rising voltage, rising frequency source to the launch motor. The linear synchronous motor takes the power from the cycloconverter and accelerates the aircraft down the launch stroke, all the while providing "real time" closed loop control. The average power from the prime power is rectified and then fed to inverters. With power from the inverters, the four disk alternators operate as motors and spin up the rotors in the 45 seconds between launches. The disk alternator is a dual stator, axial field, permanent magnet machine. The rotor serves both as the kinetic energy storage component and the field source during power generation and is sandwiched between the two stators. There are two separate windings in the stators, one for motoring and the other for power generation. The motor windings are placed deeper in the slots for better thermal conduction to the outside casing. The generator windings are closer to the air gap to reduce the reactance during the pulse generation. 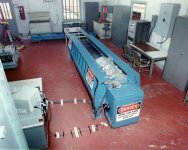 The use of high strength permanent magnets allows for a high pole pair number, 20, which gives a better utilization of the overall active area. The rotor is an inconel forging with an inconel hoop for prestress. The four disk alternators are mounted in a torque frame and are paired in counter-rotating pairs to reduce the torque and gyroscopic effects. The rotors operate at a maximum of 6400 rpm and store a total of 121 MJ each. This gives an energy density of 18.1 KJ/KG, excluding the torque frame. Each disk alternator is a six phase machine with phase resistance and reactance of 8.6 mW and 10.4 mH, respectively. At max speed, the output of one of the disk alternators would be 81.6 MW into a matched load. The frequency of this output is 2133 Hz and drops to 1735 Hz at the end of the pulse, for a max launch. Machine excitation is provided by the NdBFe 35 MGOe permanent magnets, which are housed in the rotor. These magnets have a residual induction of 1.05 T at 40 oC and create an average working air gap flux density of 0.976 T, with tooth flux densities approaching 1.7 T. The stator consists of a radially slotted laminated core with 240 active slots and liquid cold plate. The maximum back EMF developed is 1122 V. Maximum output voltage is 1700 V (L-L) peak and current is 6400 A peak per phase. The disk alternator's overall efficiency is 89.3%, with total losses of 127 KW per alternator. This heat transfers out of the disk alternator through a cold plate on the outside of each stator. The coolant is a WEG mixture with a flow rate of 151 liters/minute. The average temperature of the copper is 84oC, while the back iron temperature is 61oC. The cycloconverter, or power electronics in general, is the pivotal technology allowing EMALS to become a reality aboard ship. With a 103 m long motor, power electronics permit efficient operation by turning on only the coils that can affect the launch at a particular time rather than the entire motor at once. It also permits EMALS to operate at its most efficient point at all speeds by allowing for a variable voltage, variable frequency supply. The cycloconverter is a naturally commutated 3f-1f bridge circuit. The output of one bridge is paralleled/seriesed with outputs of other bridges to attain the power levels required. By paralleling/seriesing the bridge outputs and not the switches themselves, the design eliminates the current sharing reactors and the series capacitors. The output of a cyclo is 0-644 Hz and 0-1520 V(L-L). Simulations of the operation of the cycloconverter have been completed. The peak current output waveform of the cycloconverter is 6400 A for a max launch. The cooling for the switching assembles takes place through liquid cold plates to which the components are mounted. The medium is de-ionized water at 35oC input, 100 psig max, 1363 liters/minute. This is required to dissipate 528 KW lost in the cycloconverters. The launch motor is a linear synchronous "coilgun". The trough is the same as the steam catapult trough to allow for backfit capability. The motor itself is a dual, vertical stator configuration with the active area facing outwards. The rotor, or carriage, sits over the stators much like a saddle and protrudes through the flight deck to be attached to the aircraft. The carriage contains 160 full permanent magnets, the same type used in the disk alternator, NdBFe. The carriage is restrained in two axes by rollers. The rollers run in channels welded to the stator frame. This allows both the stator and trough to flex with the ship and the carriage to follow this flexure while maintaining a consistent air gap of 6.35 mm. The stator consists of 0.640 m long segments, which are 0.686 m high and almost 0.076 m thick. These segments turn on and off as the carriage passes. The position sense system is based on Hall Effect sensors, much as in today's rotary brushless commutated motors. The stators are protected by offsetting them from the slot in the flight deck. This is due to the contaminants, typically jet fuel, nuts, bolts, wrenches, hydraulic oil, etc., that constantly invade the trough through the slot and could, over time, affect the stators. Between the stators, in an environmentally sealed housing, are the busbars and the static switches, which are SCRs used to control the power to the stator segments. The launcher stator is based on the modular unit called a segment. There are a total of 298 segments, 149 per side, for the entire launch motor, each 0.640 m long. The segment is wound as a three phase lap winding with 6 turns per slot and a total of 24 slots. This translates to 8 poles per segment and a pole pitch of 8 cm. These coils are epoxied into a slotless stator structure with G10 separating the coil legs. The slotless stator design keeps the phase inductance low at 18 mH. The phase resistance is 41 mW while the bus resistance is 0.67 mW. The air gap working flux is 0.896 T with the armature reaction of approximately 0.24 T. At full thrust, the permanent magnets experience a shear stress of 38 psi. At the end of the 103 m power stroke, the front of the carriage enters the brake. This brake consists of shorted stator segments, which act as eddy current brakes. At the same point in time, the carriage is still covering a number of active stator segments. Two phases are switched in these segments so that reverse thrust is initiated to help with the braking force. With a projected efficiency of 70% and peak losses of 13.3 MW in the stator, active cooling will be necessary. Maximum coil action is 4.36e6 A2(squared)s, resulting in a maximum copper temperature delta of 118.2 Degrees C. The launch motor has an aluminum cold plate to remove this heat from the attached stator windings and back iron. The cold plates consist of stainless steel tubes in an aluminum casting. The peak temperature reaches approximately 155oC and, after cooling for the 45 second cycle time, cools to 75oC. The carriage that houses the permanent magnets will be cooled by convection, since there will be only slight heating from eddy currents in the carriage structure and magnets. The introduction of EMALS would have an overall positive impact on the ship. The launch engine is capable of a high thrust density, as shown by the half scale model that demonstrated 1322 psi over its cross section. This is compared to the relatively low 450 psi of the steam catapult. The same is true with energy storage devices, which would be analogous to the steam catapult's steam accumulator. The low energy density of the steam accumulator would be replaced by high energy density flywheels. These flywheels provide energy densities of 28 KJ/KG. The increased densities would reduce the system's volume and would allow for more room for vital support equipment on the host platform. Another advantage of EMALS is that it would reduce manning requirements by inspecting and troubleshooting itself. This would be a significant improvement over the present system, which requires substantial manual inspection and maintenance. The EMALS, however, will require a transition of expertise from mechanical to electrical/electronic. EMALS eliminates the complexity of the present system's conglomeration of different subsystems. The steam catapult uses about 614 kg of steam for a launch, it uses hydraulics extensively, water for braking, and electromechanics. These subsystems, along with their associated pumps, motors, and control systems tend to complicate the launch system as a whole. With EMALS, launching, braking, and retraction would be achieved by the launch motor, thereby reducing all the auxiliary components and simplifying the overall system. The hydraulic oils, compressed air, etc. would be eliminated as well as the cylinder lubricating oil that is expelled into the environment with each shot. The EMALS would be a stand alone system, completely independent of the ship's main plant. This will allow greater flexibility in the design of the ship and more efficient ship propulsion schemes. One of the major advantages of electromagnetic launch is the ability to integrate into the all electric ship. The Navy has directed substantial research into its Advanced Surface Machinery program that is developing electric derived propulsion schemes for the next generation of surface combatants. There has also been a good deal of work in high power electric weapon systems. As such, more and more of a ship's systems will evolve into the electrical counterparts of old mechanical systems. This is true of the launch, and eventually, the arresting gear. The average power required by EMALS is only 6.35 MVA. Taking these power levels off the grid should not be a problem in an all electric ship, considering multimegawatt pumps already exist on carriers for various applications. Perhaps the most interesting aspect of electromagnetic launch is the flexibility it offers in the way of future aircraft and ship designs. An electromagnetic launcher could easily be sized down to perform as a launch-assist system, augmenting the short takeoff of a STOVL aircraft. It can also be easily incorporated into the contour of a ramp, which provides a more efficient fly-away angle for the aircraft being launched. This reduces the required endspeed, the commensurate energy supplied, as well as the stresses on the airframe. Overall, an EM launcher offers a great deal of flexibility to future naval requirements and ship designs. Due to the inherent high level of elegant control of electronic equipment, it is possible to reduce the stresses imparted to the aircraft. The present steam catapult has relatively high peak-tomean acceleration profiles (nominally 1.25, with excursions up to 2.0). This results in high stresses in the airframe and generally poor performance. With an electromagnetic system it would be possible to correct for deviations in the acceleration profile in typically hundreds of milliseconds, which would result in low peak-to-means. The acceleration profile is smooth and flat, compared with a typical steam catapult profile. The simulation shows that for various load conditions, the EMALS is capable of operating within the 1.05 max peak-to-mean acceleration requirement. The result of this reduced peak-to-mean is reduced stress on the airframe. To quantify the effects of a reduced peak-to-mean, a Fracture Mechanics analysis was conducted on the airframe with both the steam catapult and EMALS peak-to-means. The results from this analysis show a peak airframe life extension of 31% due to the reduced stresses on the airframe. This is becoming more important as tight budgets are forcing the Navy to procure fewer aircraft. This also has the benefit of a safer operational environment, since when the EMALS experiences any unforeseen problems during a launch, it has the capability to quickly adjust and correct for them, even if a component fails during the launch. The EMALS offers the increased energy capability necessary to launch the next generation of carrier based aircraft. The steam catapult is presently operating near its design limit of approximately 95 MJ. The EMALS has a delivered energy capability of 122 MJ, a 29% increase. This will provide a means of launching all present naval carrier based aircraft and those in the foreseeable future. On the other hand, there are drawbacks to the EMALS. One of these is that high power electromagnetic motors create electromagnetic interference (EMI) with electronic equipment. As in the case of an electromagnetic launcher, there would be sensitive aircraft equipment sitting directly above the launch motor. Along with the aircraft equipment is the ship's own equipment, which may be affected by the electromagnetic emissions. Through proper EMC design and a "magnetically closed" motor design, EMI will be minimized. Another drawback of an electromagnetic launcher is the high speed rotating machinery associated with pulsed power applications. The disk alternator rotors are spinning at 6400 rpm, each storing 121 MJ, for a total of 484 MJ. In a laboratory, this is not a problem, but put these rotors on a heaving, jarring platform and it becomes more complicated. In order to ensure safe operation, the flywheel and bearings are to be a stiffer design than conventional. All prospective EMALS designs must be capable of launching present and future naval fixed wing aircraft from the deck of an aircraft carrier. Design goals for the program are: 30% reduction in manning, 20% reduction in life cycle cost, 20% improvement in operational availability, and up to a 50% reduction in installed size and weight when compared to the current steam catapults. The performance goals for the EMALS are:90,000,000 ft-lbs. of energy capability, an end speed range between 55 and 200 knots, a peak to mean acceleration of 1.05 for all aircraft launches (including light weight aircraft such as Unmanned Air Vehicles and Unmanned Combat Air Vehicles), and a cycle time of 45 seconds. The Navy defines the EMALS as consisting of four major subsystems: an energy storage subsystem, power conditioning subsystem, a launch engine, and a control system.